Can you believe my Dad is 90? This is a picture of my dad with his youngest grandchild, Alex, in December 2014. A lot of history has taken place over the last ninety years. My dad, Bruce, has seen and been a part of many great events in his life. He is a World War II veteran, having served in the Army at the Battle of the Bulge. He is also an avid fan of sports. He was a team member in Junior High and High School, he coached a regimental team during World War II, he went to college to become a Physical Education Teacher and Coach, he had a great career in coaching, he is a member of the Michigan High School Coaches Association Hall of Fame, he played on many recreational sports teams and even continued coaching after retirement. He is a Detroit Tigers fan having attended many of their games starting with his first at Navin Field. He roots for the Detroit Lions, even when that isn't the easiest thing to do. He attended many of his grandchildren's sporting events and when my son, Travis, was growing up they would sit at the dinner table and discuss sports. In honor of my Dad's 90th birthday, today, I thought I would share what was going on in the world of sports in 1925. William DeHart Hubbard of US, sets long jump record at 25' 10 3/4"
These events all took place the year my dad was born. My dad has many memories over the years of other sports events. He has many memories of growing up and loving sports. He remembers the first baseball game that his Uncle Art took him to. I am thankful he has shared his passion of sports with his family and captured many of the stories in his autobiography. Happy 90th Birthday, Dad. I love you. Source: "World War I Draft Registration Cards, 1917-1918," [database on-line], Ancestry.com (www.ancestry.com : accessed 23 June 2014), entry for Burt L. Watt ; number 109; United States, Selective Service System. World War I Selective Service System Draft Registration Cards, 1917-1918. Washington, D.C.: National Archives and Records Administration. M1509, 4,582 rolls. Imaged from Family History Library microfilm. The World War I draft registration card for my Great Uncle, Burton Lewis Watt, didn't provide me with a lot of new information but it was still a record I wanted in my genealogy software program. The reason it didn't provide a lot of new information was because I knew my Uncle Burt. He visited many times when I was a child and I visited him as an adult. I remember what he sounded like and how generous he was. Those things are not recorded on this record. This record does correlate what I do remember about him. The record provides an accurate description of him and I knew he worked most of his life at Lake Shore Engineering, becoming a Vice President there. I have tried to save a copy of every member of my family's draft records. Although this time it didn't provide a lot of new information, it did provide evidence that reinforced my memories. It isn't often that you find a 98 year old record of someone you remember. Burton Lewis Watt was the son of David Watt and Catherine McGee, he was the youngest brother of my grandmother, Sarah Lilla Watt Glover Bell. Source: Google Maps The First Baptist Church of Lima was formed in Lima Township in 1833. 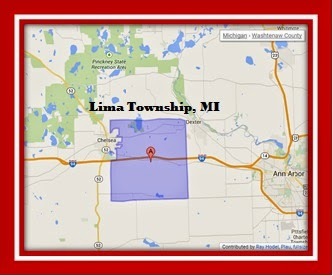 The map above shows the present day boundaries of Lima Township, Washtenaw county, Michigan. The 'A' pin denotes Lima. Lima Township is located between Chelsea, Michigan and Ann Arbor, Michigan. Church records can be a great find when researching your ancestors. I have found a few church records on my third, great grandfather Daniel Fenn, who married Huldah Rowley. These church records were found in Washtenaw County, Michigan. I am a member of the Genealogical Society of Washtenaw County (GSWC) and I have access to past issues of their publication, Family History Capers. These past issues have been a treasure trove of information and worth every dollar I have spent for membership in GSWC. Blogging as 'cousin bait' helped with these records as well. Peter, a descendant on the Glover side of my family, found some Fenn family records and shared them with me. Peter visited Bentley Historical Library at the University of Michigan in Ann Arbor, which houses some Baptist records. Peter has been a wonderful source of information. It is from the Family History Capers and Peter's research that I compiled this early history of the First Baptist Church of Lima. * My Ancestors: Daniel Fenn, his wife Huldah Fenn; their children: Tulley C. P. Fenn and Orlo H. Fenn; and Tulley's wife, Betsy Ann Fenn, nee McIntyre. I think back to what this first meeting must have been like. Lima Township was a wilderness at the time, it was in the Michigan Territory, four years before Michigan would become a state. I imagine the importance the members felt to have an organized church to attend. This tells me how important religion was in their lives. Daniel Fenn arrived in the area in the Spring of 1833. The First Baptist Church of Lima continued to worship in Lima until 1845 when the meeting place was changed to Pierceville, in Sylvan Township, the next township to the east of Lima Township. In 1851 the church became Sylvan Baptist Church and met at Sylvan Center. The church eventually became a part of Chelsea Baptist Church, Chelsea, Michigan. One never knows where church records will be found. Don't rule out the resources of the historical and genealogical societies in your ancestors area, I am glad I didn't. Clements, Samuel. Early History of the Town of Lima, Michigan. 1874? Available online at Hathi Trust. Everett, Jessie Chelsea Standard-Herald Newspaper, Chelsea, Michigan, 13 December 1906. Family History Capers, Genealogical Society of Washtenaw County, Michigan. Volume 5, Issue 2: October 1981. History of Washtenaw County, Michigan: together with sketches of its cities, villages and townships,...portraits of prominent persons...and biographies (Chicago: Chas. C. Chapman & Co., 1881). Available through Google Books. 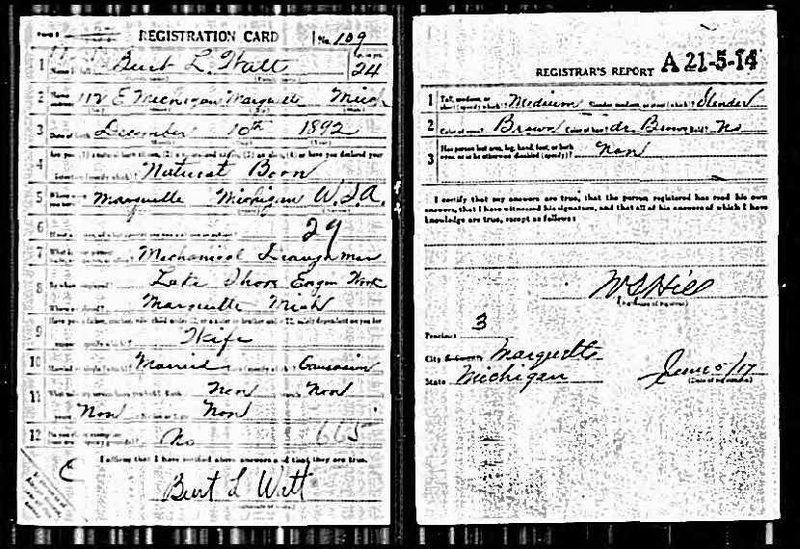 Source: State of Michigan, "Death Records 1897-1920," database, State of Michigan, Seeking Michigan (http://seekingmichigan.org/discover-collection?collection=p129401coll7: accessed 23 January 2013), death certificate number 102 for John W. Watt, Marquette, Michigan; citing Michigan Department of State, Lansing, Vital Statistics Division. SeekingMichigan.org is an excellent website for researching Michigan ancestry and in this case, death records. The website has images of death certificates from 1897-1920, with additional years promised to be added soon. Although, the Archives of Michigan has been saying that for months. The delay has to do with changing companies and getting the records into a format that can be uploaded easily and grow in the future. The image above is for John W. Watt, one of twelve children born to my second great grandparents John Watt and Jane Wilson. John W. Watt was the brother of my great grandfather, David Watt. John was born in Scotland in 1862. He immigrated to the United States in the early 1880's, settling in the Upper Peninsula of Michigan, in Marquette, Michigan. He married Annie Smith on 14 February 1888, in Marquette, Michigan. John Watt died at the age of 40, in Marquette, Michigan, of carcinoma (cancer) with hemorrhage of bowels as a contributory factor. He was the father of three children, Annie, John and Clarence, all under the age of 13 when their father died on 16 September 1902. 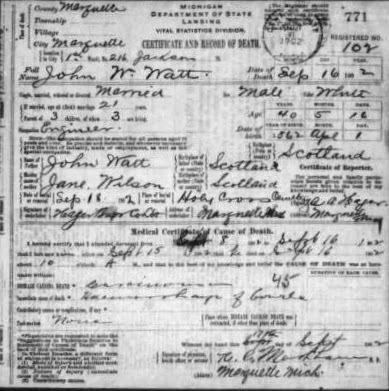 According to this death certificate John W. Watt is buried in Holy Cross Cemetery, Marquette, Michigan. How many bloggers have a page on their blog with resources that will help others if they are researching the area the blogger lives in? I think this is a great idea to include on blogs. After all, who knows the local area better than you! I have had a Calhoun County page, the county I live in, for a few months now. It is a work in progress and I add resources to the page as I learn about them. I don't have any direct ancestors who left records in Calhoun County, but in my role as President of the Calhoun County Genealogical Society I am quickly learning about county resources. Although, I haven't done a lot of research in Calhoun County, I have done a lot of research in Michigan. My eight great grandparents settled and had children in Michigan. I decided I needed to add a Michigan page as well. You will find that tab right next to the Calhoun County tab at the top of my blog page. 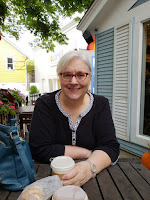 I wrote nine blog posts, in the Spring of 2014, about researching in my home state of Michigan. Clicking on the Michigan Resources tab will take you to the page of my Pure Michigan Genealogy posts. These posts are filled with resources, tips and links to help with researching in Michigan. Please check both pages/tabs out and learn more about why Michigan is a great place to have Ancestors from.